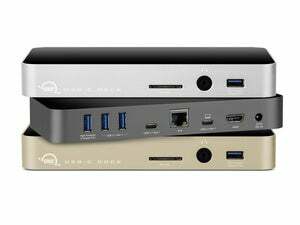 Anker's dock offer 4K HDMI, pass-through power, and two USB 3.0 Type-A ports, but has limits worth noting on its USB power. 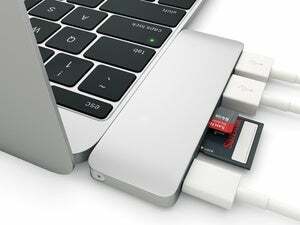 No 12-inch MacBook is an island; every portable of this line requires some kind of main connection. That’s at least a USB-C power adapter supplied by Apple, but more options have started to appear in the form of mini-hubs and full-fledged ones. 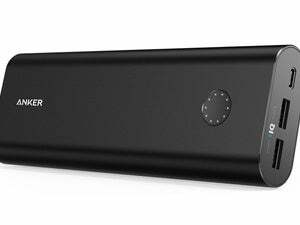 I’ve been particularly waiting for affordable, portable alternatives to Apple’s $80 Digital AV Multiport Adapter. 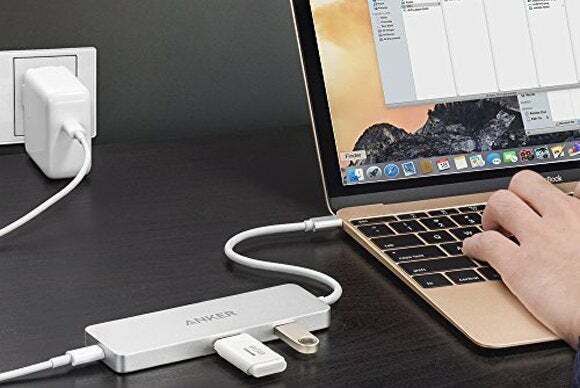 The $60 Anker Premium USB-C Hub with HDMI and Power Delivery (available at Amazon) fits the bill nicely with more ports, better flexibility, and a lower price. These compact hubs have full-fledged computers in them to handle all this conversion, but their job should be to not get in the way of data transfer. In testing, the Anker hub did just fine. With an external USB 3.0 drive (a bus-powered WD My Passport Ultra HDD 2TB), I got 90 MBps read and write rates through the hub’s USB 3.0 Type-A ports, just as fast as using Apple’s USB-C to Type-A adapter for a more direct connection. HDMI output worked as expected as well, providing a solid, stable signal. One odd note, however. I wasn’t able to get the MacBook to recognize drives plugged into the Type-A ports initially; I had to reboot the Mac, at which point I had no further problems. That makes it seem like more of an OS X oddity than related to the dock, which requires no hardware drivers to work correctly. 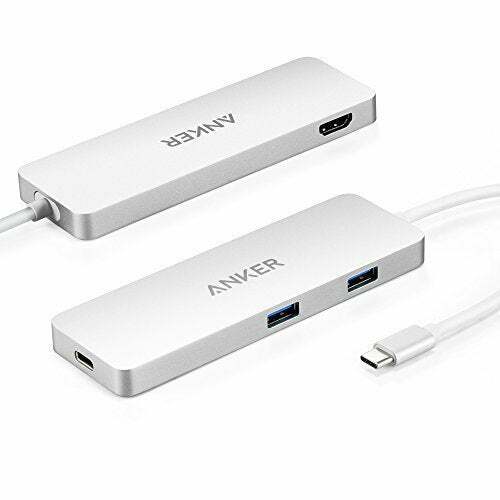 The Anker measures 4.7 x 1.6 x 0.4 inches, and I particularly like that the USB-C port for pass-through power is at the end of the longest dimension. Couple with a 6-inch integral cord to plug into your MacBook, this gives you a lot more flexibility in placement. It’s just 2.4 ounces, making it a slight addition to your satchel or travel bag. Anker has admirable frankness about limitations, although these appear oddly not on its site, but on the linked Amazon page for the product, nor in the manual. (Anker sells and ships its products via Amazon fulfillment.) These disclosures are far more extensive than any I’ve seen from other pass-through power docks. For instance, the dongles for wireless keyboards that use 2.4GHz unlicensed spectrum (whether Bluetooth, Wi-Fi, or proprietary) might not work, and Apple’s SuperDrive can’t be used. The webpage also notes that Western Digital drives may not be supported and, sure enough, I saw some instability with keeping my model mounted, although I was able to run extensive suites of speed tests without a hitch as the only USB drive connected. If you own portable WD drives and prefer them, this would be a reason to not opt for the Anker dock. The page notes the maximum total current available for USB via the Type-A ports is 1500 milliamperes (mA) while the USB-C power adapter is connected to the hub, and 900 mA without. This should be fine with most powered USB devices besides hard drives. The included manual only cites the 900 mA limit without the connector, but provides a list of amperage draw by device type, which strangely excludes smartphones and tablets. This was troubling, so I tested in a variety of ways. I plugged in an iPhone 6s, which can draw anywhere from 500 mA to nearly 2000 mA (2 A). With the iPhone attached, I had troubles copying large files with both the WD drive and a USB 3.0 flash drive from SanDisk. The drives spontaneously unmounted and remounted, which supports a power issue. With the iPhone unplugged, this problem went away. I didn’t read similar warnings nor did I have similar problems with the Satechi USB-C dock I tested recently, but it doesn’t include HDMI support, and there may be tradeoffs in terms of power and circuitry, no matter what’s connected. I can’t recommend the Anker as wholeheartedly as I’d like, because drive unmounting can result in lost data or drive issues, as well as being frustrating and a hassle. If you plan to attach unpowered drives routinely to a dock, this isn’t the right solution except in limited cases, potentially with just a single, non-Western Digital drive attached at a time. The Anker is a great choice for connecting an external display. You may find some limitation with other devices, though.